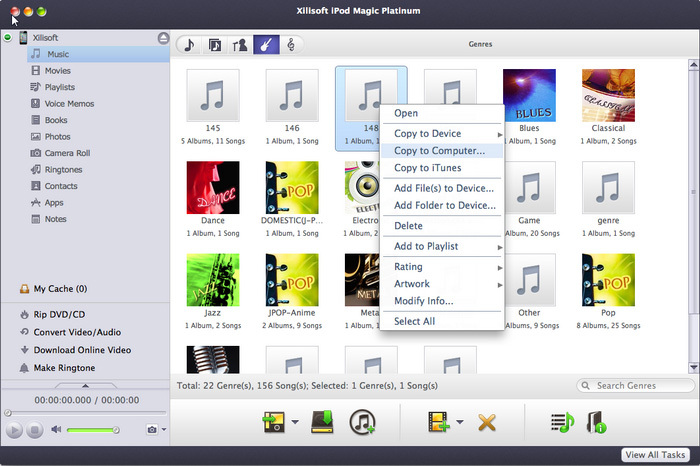 Xilisoft iPod Magic for Mac makes it easy to backup, transfer and manage your iPod/iPhone music, movie, photos, apps, sms, message, etc. It is also able to convert Home DVD movies and non-iPod video/music format files to iPod/iPhone. What's more, using this Mac iPod manager, you can download online videos to iPod and make special iPhone ringtones. Furthermore, you can manage several iOS devices simultaneously. Convert common and HD/3D videos in 160+ formats on Mac. Merge, clip and split videos, add video effects, watermark, subtitle, soundtrack, etc. 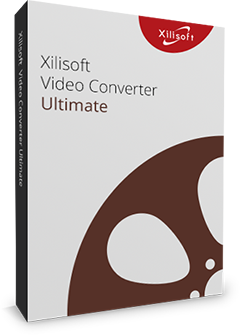 Convert DVD to 160+ videos/audios on Mac. Convert DVDs to be playable on any mobile phones and tablets. Merge/clip/split videos, add effects, subtitle, etc. Backup iPod music, movies, books and photos to your Mac easily and quickly. It is possible to read and export videos and photos recorded by device now! Choose the movies, music or photos you like on your Mac and transfer them onto iPod directly through this iPod manager. Allow you to copy iPod music, movies, and photos from iPod to the iTunes library to help you manage your multimedia files. Support transferring playlist to iTunes. Manage up to 26 iPods and 1 iPhone at the same time and drag & drop files among them to share music, movies, and photos. Save time by connecting iOS devices simultaneously and transferring files between them by dragging and dropping. Multiple view types are supported for showing music, movies, photos: Song, Albums, Artists, Genres, Composer modes for music; Movies and Genres modes for movie files; Photo and Albums view modes for photo files. Convert DVDs to iPod MP4 videos or MP3/M4A music and transfer them to iPod/iPhone in one click. DVD ISO image file and IFO file are also supported. Video and audio files such as M2TS, MTS, AVI, MPEG, WMV, DAT, TS, MPV, NSV, MOV, QT, H261, H264, WMA, AAC, AIF, AIFF, AC3, etc. can all be copied to iPod/iPhone by first converting them to iPod supported video/audio formats. Choose from a list of optimized iPod video/music profiles to convert files to iPod video and music or create your own customized profiles by adjusting output parameters. One click to download fantastic online videos, convert and transfer them to iPod. It is so convenient to logon top popular online video websites and view videos with the embedded web browser. Supported websites include YouTube, Metacafe, Dailymotion, Break, Vimeo, Revver, Blip, Vidilife and Stickam, ESPN, blogTV, NicoNico. Convert audios to iPhone ringtone files or extract iPhone ringtones from videos. You can also clip file to just output the wanted part, add fade-in and fad-out effects and adjust ringtone volume to create a personalized iPhone ringtone. Support all types of iPod/iPhone: iPad, iPad 2, iPad 3, iPad 4, iPad mini, iPad mini 2, iPad mini 3, iPad mini 4, iPad Air, iPad Air 2, iPad Pro (12.9/9.7/10.5 inch), iPod, nano (5th Gen), iPod mini, iPod shuffle, iPod classic, iPod touch, iPod touch 4, iPod touch 5, iPod touch 6, iPhone, iPhone 3G/3GS, iPhone 4, iPhone 5/5S/5C/SE, iPhone 6/6 Plus, iPhone 6S/6S Plus, iPhone 7/7 Plus, iPhone 8/8 Plus, iPhone X, iPhone XS, iPhone XS Max, iPhone XR. Automatically recognize your iPod/iPhone type upon connection and displays info such as picture, type, capacity, and version in the main interface. Delete, create and edit iPod/iPhone playlists; search for iPod/iPhone files with Quick Search and Filter functions; establish, remove and rename photo albums; view music, movies, and photos in playlist or thumbnail view; set illustrations for music/video; rate your iPod/iPhone files. Check music/movie file info and edit the ID3 tags info for multiple files simultaneously. Use the built-in media player to play your music and movie files on your iPod/iPhone or to preview your DVDs or videos before converting them. Build playlists as you wish; Transfer songs from one playlist directly to another. Import and export contacts to get rid of trouble of losing important contacts information and precious MSN messages. iTunes-style interface, shortcut keys for operation, user-friendly design and layout make the program easy to use for all users. With the highest transfer is speed possible both via data connection cable or Wi-Fi, transferring files between iPod, iTunes, and Mac can all be done in a blink of an eye! 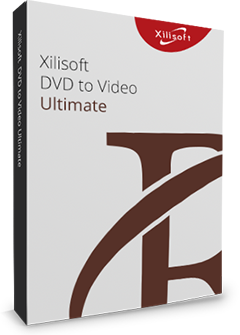 Copyright © 2004-2019 Xilisoft Corporation. All rights reserved.